Samjautha blasts- Is this priest the link? Author Vicky NanjappaPosted on December 19, 2012 December 20, 2012 Categories TerrorismTags Colonel Purohith, Dhan Singh, Malegaon Blasts, Mecca Masjid Blasts. Ajmer blasts, Rajendra Chowdhary, Ram Lakhan Maharaj, Ramji Kalasanghra, Sadhvi Pragya Singh, Samjautha Express blasts, Sandeep Dange, Sunil Joshi, Vicky Nanjappa6 Comments on Samjautha blasts- Is this priest the link? The failure on the part of the National Investigating Agency has ensured that an accused in the Malegaon 2008 blasts case got bail. The Special Maharashtra Control of Organised Crimes Court (MCOCA) court judge Y D Shinde granted bail to accused in the case, Lokesh Sharma. The court whil granting him bail ordered him to execute a personal bond of Rs 25000. After his arrest in connection with the Malegaon 2008 case he was produced first before the court on February 27 2012. However the NIA which ought to have filed the charge sheet within 90 days of his arrest failed to do so. The court while taking into account this discrepancy ordered that bail be granted to Sharma. Sharma was first named by the NIA in the Samjautha blasts case. He is said to have been closely associated with Sunil Joshi and in their remand application the NIA had stated that he was the one who planted the bomb on the train. During investigation, the NIA is said to have found links between this man the other accused in the Ajmer, Malegaon and Mecca Masjid blasts as well. A resident of Indore, Madhya Pradesh, Sharma according to the NIA was also closely associated with terror masterminds, Ramji Kalsanghra and Sandeep Dange. The duo are however still absconding. Two persons have been picked up from Belthangady in Mangalore in connection with the Malegaon and Goa blast case. It is learnt that the two persons belonging to the Sanathan Sanstha were reportedly picked for questioning for their alleged role in the Malegaon and Goa blast case. Sources informed that the two persons picked up are Vinay and Uday. However details regarding their alleged role in the case has not been elaborated as yet by the investigators. The duo have been taken by the investigating agencies for further questioning. A team of the investigating agency had gathered information based on the questioning of the other accused in the case and picked up the duo from Belthangady at 5. PM on Monday. However the duo appear to be low ranking operatives in the case, but it is hoped they would throw more light on the rest of the absconders and also the case. The NIA which is probing the case would however have to get into their fold Ramji kalsanghra, Sandeep Dange and Suresh Nair in order to complete investigation. 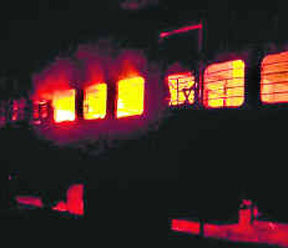 The National Investigating Agency appears to be making progress in the Samjautha Express blasts case. The arrest of a man by the name Kamal Chouhan who is alleged to the person who planted the bomb ensures that the NIA is getting closer to closure of the case. Although speculation is rife that Chouhan’s arrest is being timed with the Uttar Pradesh elections in a bid to appease to a certain community, NIA sources say that they were on the look out for this man since the past 6 months. The investigation that we conducted revealed that he was in the same group that Sadhvi Pragya Singh and Suni Joshi were in and he worked as a team with the other two accused, Ramji Kalasanghra and Sandep Dange. Chouhan was first questioned in connection with the Sunil Joshi murder case. After that the NIA had summoned him once again for interrogation However he refused to appear before the NIA and decided to give them the slip. The NIA has been in his pursuit since the past several months now and finally managed to nab him in Indore. When he gave them the slip the NIA had issued a look out notice for him apart from announcing a cash reward of Rs 2 lakh to anyone providing information on the man. Since the past couple of days the NIA has stepped up its efforts to close the Samjautha Express case. They have already chargesheeted Swami Aseemanand, Sadhvi Pragya Singh among those alive and available. Among the absconders the names of Kalasanghra and Dange figure and there is also the name of Sunil Joshi who was allegedly murdered. Kamal Chauhan is standing member of the RSS a resident of Moorkheda village near Indore, is said to be one of the conspirators in the case. He is suspected to be one of the persons who planted the briefcases loaded with explosives and pipe bombs used in blast. The NIA says that his involvement in the case was tracked with the help of the signals emitted out of the mobile tower on the day of the blasts. In fact he is said to have carried the brief case with the explosives with three others. He was part of the cell that planted the bomb and also hatched the conspiracy according to the NIA. They would also question him for his role in the Sunil Joshi murder case and also the murder of Ramprasad Kalota. They would also try and find out more about the Joshi murder. They believe that one senior leader of the RSS, Joshi and Kalota were murdered to ensure the end of investigations into incidents involving Hindu extremists. Kamal along with three others are said to have played a vital role in the murder according to the NIA. On the Samjautha case, the NIA says that the pipe bombs were manufactured in a factory at Pithampur owned by one Vinay Pandey and stored in kamal Chauhan and Sunil Joshi cowshed near Depalpur and Moorkheda village. Kalota had collected and also distributed the bombs which were stored in the cow shed of Sunil Joshi. Further the NIA says that Chouhan had taken part in the conspiracy meetings held in Gujarat and Nagpur. A couple of days back the NIA had put out advertisements seeking information on three very crucial players in the Samjautha case. They included Kalasanghra, Dange and also Suresh Nair. While the arrest of Kamal Chouhan may be a step forward in nabbing the absconders and also cracking the Joshi murder case, it is yet to be seen how big a catch is this man in the first place. The arrest was made based on proper information, the NIA says. The doubt however grew when he refused to turn up for questioning and decided to give the slip. His role was known since day one. We believe that he is one of the persons who planted the bomb in the train along with Dange and Kalasanghra and this is the line of interrogation at the moment. Apart from this what is more important for the NIA is to track the other two major players Kalasanghra and Dange who are considered to have a lot of information on them. It is said that the little known Chouhan was part of the same module that all the above mentioned names worked for. He could have been just a foot soldier and further investigations would reveal more information on his exact role. However a surprising fact about Chouhan is that the man never figured in the investigation of Sadhvi Pragya Singh. Although she too has been chargesheeted in the same cases, it is quite surprising that the name never cropped up. However sources say that certain things are deliberately not declared as it tends to tip off the accused. Even the Sadhvi investigation does not have the name of this man, further investigations can be conducted and there is always this option of filing an additional chargesheet in the case. Chouhan however is a relatively new name in this Samjautha case. Unlike the rest his name has not done the done the rounds. Sources in the Madhya Pradesh government however point out that his name could have cropped up during the interrogation of the 30 odd men that took place in Indore a couple of months back. NIA sources however say that there are a couple more such persons who were involved in the case. The Samjautha operation was not a small one and had many more such players in it. However the focus now is on Chouhan and also chalking out a strategy to pick up the absconders who could well be hiding in Nepal, the NIA also points out. 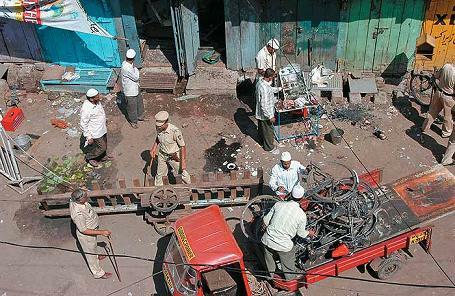 There was one thing common where the Samjautha Express, Ajmer and Mecca Masjid blasts are concerned. All these three cases today as per the investigations are inter-linked and it is only a matter of time before the National Investigating Agency closes these cases. The NIA has a dual job in all these cases now. Apart from having a lot to do they also have a lot to undo in all these cases. When one takes into account all these cases, at least 110 members from the Muslim community were arrested after being blamed for these attacks. While many of the accused in the Mecca Masjid blasts were let off by the court after investigations took a different turn, the same exercise will have to be conducted in the other cases as well. The NIA will however be bundled with problems before all these cases come to a close. They have managed to file the chargesheet in the Samjautha case and sources say that this was done first only because of the international ramifications it has. Moreover it was also a means of putting pressure on Pakistan to act in the 26/11 case. Activists from Hyderabad and Ajmer however say that they wished the same speed was applied in these two cases as well. Lateef Mohammad Khan from Hyderabad says that the situation is the same in Ajmer and Hyderabad and there are a lot of people awaiting justice. Only once the NIA files its chargesheet in both these cases will the innocent youth be able to rest in peace. These activists say that the accused persons in all these cases are more or less the same. However they are hoping that the probe would pick up since at the moment it appears as though these two cases have come to a stand still. While this is one part of the case the other question that is being asked by several persons is the UN report relating to the Samjautha case. The UN report dated 2009 still shows Arif Qasmani, a close Dawood Aide as the key plotters of the Samjautha express blasts. Qasmani a resident of Karachi who today facilitates the movement of Al Qaeda terrorists in Afghanistan is shown as one of the main accused in this case. It is said that he had raised funds through Dawood to fund this attack. The Samjautha chargesheet however does make any mention of this which would mean that the Lashkar-e-Tayiba angle is not being looked into. So far as the UN report goes that would be changed once the trial is complete and the information sent across. However what investigators say is that Qasmani continues to be a major threat to India and what they have been able to ascertain is that he was the major player in the 2006 train blasts. While the NIA was never easy thanks to the multiple angles in all these case, the job was made slightly easier with the confession of Swami Aseemanand. However today he has decided to withdraw the confession stating that it was done under duress. The NIA however points out that confessions are never the sole aspect of a chargesheet. The leads are picked up from the confession and independent investigations are conducted based on those leads. The withdrawal of the confession would not have any impact on the case. The links and the roles of these persons have been ascertained and now the battle is before the court. His confession also covered both the. Ajmer and Mecca Masjid blasts and this withdrawal will not have any impact on any of these cases, investigators also pointed out. Indresh Kumar: This was one of the names that did the rounds all through the past few months. However Kumar has not been shown as an accused in the Samjautha chargesheet. No doubt that the NIA dug very deep into this particular angle of this case, but the fact was that the material which was found on him was not convincing enough to name him as an accused in the case. The investigators however point out that this is no indication that a clean chit has been given. It is just that more evidence needs to be brought forward in order to even name him in the case. Moreover the case relating to Kumar is not a simple one. Considering the position that he holds any wrong move could have horrible political ramifications and hence the NIA would want to tread carefully on this aspect. Indresh Kumar was once questioned by the CBI and is likely to be questioned by the NIA too. They would also be exploring the alleged rivalry between Colonel Purohith and Indresh Kumar in order to get further leads on this angle to the case. While it is believed that the Ajmer, Samjautha and Mecca Masjid blasts were carried out by one module while the Malegaon blasts were staged by another, investigators would continue to see if the two are linked. Sunil Joshi, Ramji Kalsanghra and Sandeep Dange are the common persons in all these attacks. Swami Aseemanand too had spoken about Kalsanghra and Dange stating that they had bombed Malegaon. While investigators feel that the big fish have been netted in all these cases, there are many aspects that remain incomplete thanks to the fact that two very crucial operatives are still missing. Dange and Kalsanghra are very crucial not only to the case but also to the busting of these modules. Take all the blasts mentioned above. These two were part of each and every meeting. They have taken part in meetings convened by Sadhvi Pragya Singh, Sunil Joshi and also Aseemanand. Moreover these were not ordinary foot soldiers and had ample information on the functioning of the entire module. The duo were extremely close to Sunil Joshi (now dead) who is considered to be the big boss of all these operations. In fact it was Joshi who wanted the Samjautha express blasts to be carried out as he wanted to eliminate the Pakistanis on the train. Not only will the duo provide information on all the operations and the manner in which the modules have been functioning, but they will also be able to help investigators find more clues on the Joshi murder, which again is suspected to be an insider job.